Prenatal vitamins are essential for the early growth of the child. The One A Day Women’s Prenatal Vitamins contains the essential folic acid as well as other key nutrients. It contains DHA, calcium, iron etc as well. It provides an overall nutrition for the growing fetus that helps with the physical as well as mental development. It is beneficial for the expecting mother to sustain the good health. The One A Day Women’s Prenatal Vitamins is suitable for the pre-pregnancy, pregnancy and post-pregnancy period. It ensures the child’s health right before consumption and even through the infancy. The 60+60 count pack contains one bottle each of prenatal tablets and soft gels. Vitamins A, C, D, and E- The vitamin C protects the cells and help maintain healthy cells. Vitamin D helps with the calcium and phosphate regulation in the body and helps the body absorb calcium. The addition of the vitamin A and E helps negate the deficiency. B vitamins thiamin (B1) & Riboflavin (B2): Thiamin helps convert carbohydrates into energy for both mother and the baby. It is good for the nervous system, heart and muscles as well. Riboflavin also ensures that there is enough energy in the body. In addition, it is essential for the bone and muscle development of the baby. It also benefits the nervous system. Niacin, Vitamin B6, and B12- Niacin is for the digestion and reducing nausea. B6 is for the nervous development of the baby. It is also good for the mother to get the happy hormones and neurotransmitters. B12 is helpful in preventing birth defects and is good for nerves and spine health. Folic acid is the most important vitamin for pregnancy, especially during the early period. It reduces risks on the fetus and helps avoid birth defects. Biotin is to avoid the deficiency. Pantothenic acid can ease leg cramps. Calcium is needed for both the mother and baby. It helps the baby develop bones and teeth while it maintains the mother’s bone health. Iron helps avoid anemia by maintaining healthy formation of hemoglobin. Iodine is essential for the thyroid functioning of the mother while it can boost the baby’s brain. Magnesium can relax the muscles. It is highly important to avoid premature contraction. It is good for bones and teeth. Zinc is needed for the DNA construction of the baby. Copper is required for the red blood cell formation, blood vessels, and skeletal system. One A Day Women’s Prenatal multivitamins tablets contain the vitamins and minerals while the soft gels have the omega fatty acids. Omega-3 fatty acids from fish oil: Omega- 3 fatty acids are a generally essential nutrient for everyone. For the growing baby, it plays the role of developing healthy brain and nerve development. It can also help the baby be immune to allergies, asthma etc as well. The omega-3 fatty acids contain DHA, EPA, and ALA.
DHA is added in addition to that in the fish oil. It helps the baby get healthy brain, nerves, and eyes. EPA is the natural partner of DHA. All the benefits of one are because of the presence of the other. Having them in the right amount can help avoid postpartum depression in women. The dosage of the One A Day Women’s Prenatal Vitamins is one tablet and soft gel each per day. You may take them at any time of the day. No specific time has been given for the dosage, you may take it whenever you prefer to like. You may take them together or at separate times. These tablets and liquid gels are beneficial for expecting mothers as well as during breastfeeding as these nutrients are passed on to the baby through milk. There are no drug interactions for the One A Day Women’s Prenatal Vitamins unless there is an allergic reaction to the fish oil. There are a few reports of side effects after using these vitamins. The possible side effects are the upset stomach, constipation, nausea and fishy burps. The reviews show mixed reactions with regard to side effects. The fishy burp is only slight. There are no adverse effects of taking the One A Day Women’s Prenatal Vitamins. People are using the One A Day Women’s Prenatal Vitamins right from when they are planning to conceive. The reviews show that the vitamins have been effective and healthy. The only problem with these vitamins is when they suffer some kind of side effects. Though the side effects are seen it is not too wide for everyone. Yet, there are quite a number of sufferers as well. People who have had slight side effects have also gone ahead and continued with it. The complaint about the One A Day Women’s Prenatal Vitamins is that there has been a shortage in the specified number of pills and liquid gels. There are cases where there is the shortage in only one of the types. There still are cases where pills are short of 60 in both the bottles. One A Day Women’s Prenatal Vitamins is widely available online. You can get it from most of the popular online stores for supplements. There are mainly 2 packs available- 30 pills or 60 pills in each bottle. 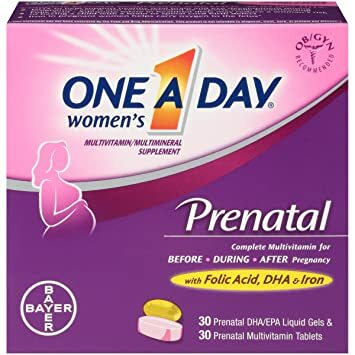 One A Day Women’s Prenatal Vitamins in Amazon is available in 2 packs of 30+30 or 60+60 packs where you get one bottle each of the multivitamin and DHA liquid gels. The former pack lasts for a month and the other is 2 months supply. One A Day Women’s Prenatal Vitamins in Costco: you can get the One A Day Women’s Prenatal Vitamins in Costco. You most probably get the larger packs for the individual bottles of tablets and soft gels. One A Day Women’s Prenatal Vitamins in WalMart: The One A Day Women’s Prenatal Vitamins is available in WalMart as well. The One A Day Women’s Prenatal Vitamins 60+60 count price is $24.49. The price may vary from $14.46 to 24.49 depending on the online store. One A Day coupons are available online with which you may get discounts on the One A Day Women’s Prenatal Vitamins. The coupon codes are eligible to get discounts of 20% off on the price. You can get the coupon codes and promo codes from Couponcabin.com, Coupon.com, and CouponSherpa.com etc. Are One A Day Women’s Prenatal Vitamin soft gels safe? Yes, the One A Day Women’s Prenatal Vitamins soft gels are safe for all women. It is made to suit the needs of a woman’s body from conceiving to the nursing period so that the baby gets all the nutrients that are essential for a healthy growth. Other than the few side effects there are no major problems with these vitamin tablets or soft gels. Is One A Day Women’s Prenatal Vitamins FDA Approved? One A Day Women’s Prenatal Vitamins is an over-the-counter supplement that is not regulated by the FDA. Does One A Day Women’s Prenatal Vitamins work? One A Day Women’s Prenatal Vitamins is a nutrient bank that supplies the key nutrients for the proper and healthy growth of the baby inside the womb. The supplement could also be continued after the birth to ensure healthy brain, nervous system, eyes, bones and teeth development for the baby. It also helps in preventing any birth defects for the child. How long should I continue taking the One A Day Women’s Prenatal Vitamins 60-60 count? You can start the supplement before pregnancy and continue for as long as you are nursing the baby. Even after that, you can continue with them if your health needs it. After all, everyone needs the multivitamins and the omega fatty acids. One A Day Women’s Prenatal Vitamins is one of the safest over-the-counter supplements. It contains an essential pregnancy vitamin folic acid in a good amount for the daily need. The presence of calcium, omega fatty acids and iron makes it a complete package of pregnancy nutrition. It is one way of ensuring that you have a healthy baby and continue to stay healthy yourself.